INTRODUCING OUR NEWEST ITEM "RHYTHM OF LOVE"
Seaching for the next HOT NEW jewelry item? Introducing the RHYTHM OF LOVE collection. It's the only diamond jewelry that is powered by her heartbeat! 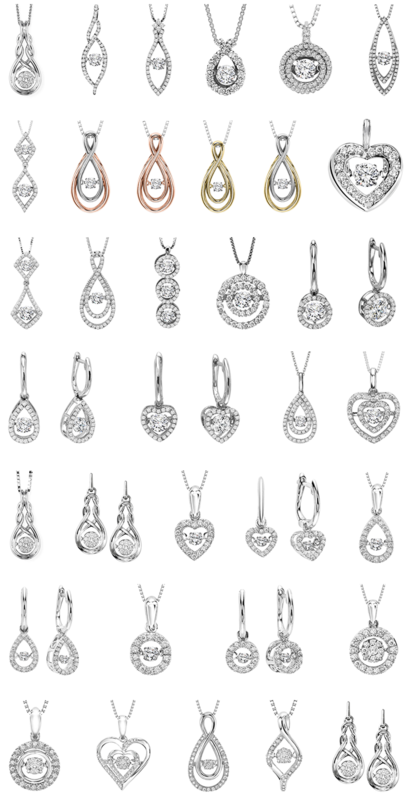 At the center of each pendant or earrings is a newly patented mounting that allows the center diamond to be in a constant state of motion, with every beat of her heart. *Guys, make her heart beat faster this Christmas with a Rhythm of Love item! It's like nothing she has ever seen before, diamonds that dance to the rhythm of her heartbeat! *Ladies, you'll want to be the first person to be wearing this gorgeous line! Make sure the special someone in your life does not miss out on this amazing new item! RHYTHM OF LOVE collection possibly the most beautiful diamond jewelry ever created ! Available EXCLUSIVELY at MINNUTO JEWELERS! !